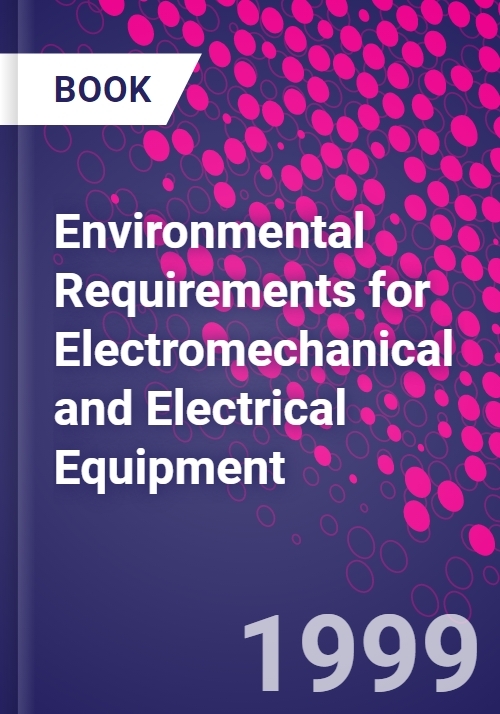 Environmental Requirements for Electromechanical and Electrical Equipment is the definitive reference containing all of the background guidance, typical ranges, details of recommended test specifications, case studies and regulations covering the environmental requirements on designers and manufacturers of electrical and electromechanical equipment worldwide. The recent introduction of the European EMC directive is just one aspect of the requirements placed upon manufacturers and designers of electrical equipment. There are numerous national and international standards and specifications that describe the application environment in which equipment must function. Factors that must be taken into account include temperature, solar radiation, humidity, pressure, weather and the effects of water and salt, pollutants and contaminants, mechanical stresses and vibration, ergonomic considerations, electrical safety including EMC, reliability and performance. A broad range of standard tests exist which must be passed by equipment if it is to fulfil the requirements placed upon it. Ray Tricker is the author of a number of books describing the regulatory framework within which the electronics and electrical equipment industry must function, including Quality and Standards in Electronics, also published by Newnes. This latest volume will give the designer or manufacturer a first point of reference when negotiating the minefield that is the global market for their products.